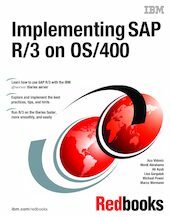 This IBM Redbooks publication features a collection of knowledge gained from IBM and SAP solution experts who work with customers that use SAP R/3 on the IBM eServer iSeries server. It was written to assist R/3 basis consultants and other IT professionals in implementing a total business solution consisting of iSeries and AS/400 servers, OS/400 Version 4 Release 5 (V4R5), SAP R/3 Release 4.6C, DB2 UDB for iSeries database, and complementary solution products. Part 1, "Understanding the solution", presents the concepts and other basic knowledge necessary to understand the structure, features, and functions of the SAP R/3 solution on the iSeries server. Part 2, "Implementation", describes the implementation techniques necessary to install and properly set up R/3 in the iSeries environment. It contains detailed guidance and explanations of the specific tasks associated with the implementation. Professionals involved in implementing R/3 on OS/400 may, at some stage, face all the topics covered in this part. Part 3, "Advanced topics", covers topics that will be of interest to those who want to enhance their SAP R/3 installation by improving performance and adding additional functionality.